It is like a mighty ocean forming from little streams and rivers, unnoticeable at first, but unstoppable in the end. Once a week, men, women and children from all over the city, and around it, congregate to this little forgotten corner of Paris. Turning around twisting alleys, braving the cold and the distance, they come and collect. They come by different ways ' by train, by bus, by car and on foot. Its like a call which cannot be heard, and once a week the faithful respond to its summons. Bobigny is in the Paris banlieu, the suburbs that lie just outside the city, where the middle class lives. It is a suburb of individual, plotted houses ' a luxury after the dense cramped apartments of Paris ' and tall apartment buildings, and businesses and offices which have escaped the astronomical rental of the bigger city. It is suburbs like this which are the dream of the French middle class, to escape the city and have a house of your own, a little garden, and a space to call your own. Low-rise development ' this is the key of most of French suburbia. Often built around an existing village, most suburbs have a church in the town centre, a reminder of the past, and still a place where the faithful gather on Sundays. The houses are low, one or two stories, often with quaint little details attesting to the French love of tradition. In the midst of all these neighbourhoods, there is a house which at first glance is like any other, low and inconspicuous. But once close, you see an orange flag rising up from a pole. TheNishan Sahib is low and discreetly placed, and is the only sign that here things are a little different. This apart, there are no loudspeakers, no dome, no outwardly visible sign of difference. Appearances can be misleading. 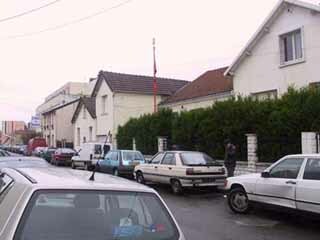 This is the Gurudwara of Paris, the only Gurudwara worth the name. Its reknown, however, far exceeds its size. In a country where Sikhism has no more official status than an obscure sect, the Gurudwara is a symbol, a beacon of hope, a rallying point for the scattered and diverse Sikh community of France, and a place where men and women come to meet others like themselves, to escape for a little while the life outside which is tough, and hard, and unforgiving, as is the life of all immigrants who are far from their home, and here they can pretend for these few hours that they are home, and for a time share their lives with others who feel the same way. To be a minority is tough. To be a minority in a country where most people have never even heard of your religion, and where all visible signs of difference are looked at suspiciously, is even tougher. France is a hard country to be different in, and if you have beards, long hair and turbans, it can be very tough indeed. If you do not speak the language, this almost guarantees that the only jobs and work you can find will be underpaid labour where you will be exploited to the utmost, your employers taking advantage of the fact that you have no other place to be, no other option in hand. It is no wonder that the Sikhs of France, for the most, have removed their turbans and go around clean-shaven. This is the basic minimum necessary. France's demographic profile is changing fast under increased immigration from its former colonies and elsewhere, and now immigration policies are the root of increasing public debate. The consensus is that immigration must be stopped, and so if you are visibly an alien, things can be difficult. That immigration is necessary in a country with an aging population is something which is overlooked, as these things so often are, in politics, and that the immigrants provide valuable services to France is another fact glossed over. 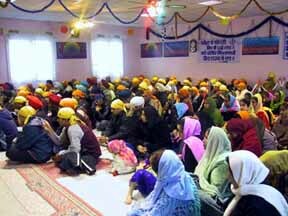 So most of the Sikhs in the Bobigny Gurudwara have no turbans, and many of them are clean-shaven. The loss of your own identity is the price to pay for living in the West, the land where your dreams are supposed to come true. And so in his katha, the baba tells stirring martial tales of heroism and bravery from Sikh history, from young Sikhs being martyred in their thousands under tyrannical Mughal emperors to stories of the Gurus voluntarily sacrificing themselves, and their kith and kin, to save the honour of the Sikh faith. There are stories of sworn enemies grudgingly admiring the valour of the Sikhs, and then more tales of miracles wrought, enemies slain, insults avenged. A Sikh never buckles under, says the katha, and does the baba know, perhaps, from his years of doing this, does he sense that these tales bring back a sense of pride and hope to young and old alike, who have been brought up sworn to defend their faith, and yet now have to go around in anonymity, removing all signs of being the chosen ones as a concession to survival? Death before dishonour, say the Gurus, but you can sacrifice yourself but it is not so easy to sacrifice your loved ones. Dishonour is the price for having a family in a foreign land. The raagi chants his verses, and we adults listen, the one rapt, the other elsewhere. You can see these things on people's faces ' here's one worrying about his children, the other about the money he has to send home. There is another one who is fidgeting, unsure if he should leave yet or not, and then those in the corner are getting up already. Some know the verse, and sing along. The women sit in their corner, dressed for the day, and the young girls have put on suits and dupattas, a change from what they wear everyday. It is the younger children who are true products of France, and its wonderful cosmopolitanism, born here and brought up here, speaking French totally fluently and in most cases being far more comfortable with it than with the language of their parents. It is a wonderful world for them while they are children, to be able to have their own secret language which their parents cannot understand and are uneasy with, it is every child's dream to have his secrets, this is his small victory over his parents who control every other aspect of his world. And so, for them, this is the time when they play and laugh, for they are still young, and have much to learn, and everything is still perfect, and the world has not yet taught them that there are things like differences in skin colour, and the fact that you have long hair and a piece of cloth on your head makes you different, and somehow less of a human being than the rest. The youngest ones have still not been the subject of cruel children's' jokes, or in some cases are still too young to understand, but the older ones, they understand, that in spite of their French, they are still, in some way, not French, and their parents tell them that they belong a land which they have never seen, and where they would not now fit in. This academic semester, France brought into force a law which says that religious symbols are banned in school. This law also applies to turbans. There was not much intervention on behalf of the Sikhs by the Indian government, and this is something which rankles amongst the Sikh community here in Paris. Three weeks ago, three young Sikh boys were turned out from school for wearing turbans. This caused consternation amongst the community, but what do you do when you are such a small minority, and a politically helpless one? When your own government does not support you, then it is difficult to find support in a foreign land. The gurdwara management has engaged a prominent lawyer, but there is not much hope, for the law cannot be changed for a miniscule percentage of the population. What is surprising is that the Indian government has not made any reasoned case, a case based on the fact that for a Sikh, his turban is not his religion, but a part of his very life, one of the very signs of his existence. The Bible says that Adam and Eve wore clothes so that they would not be embarrassed, and so it can be easily argued that wearing clothes is a sign of Christianity, but for the moment there are no signs of clothes being banned in schools as overt religious symbols. Gurkirat Singh (name changed) stammers a little, and when he gets emotional his stammer is more pronounced. When he talks of the promises made to the Sikh nation at the time of independence, when he talks of the hurt and betrayal of the Sikhs when Punjab was cut up into three states, when he talks of the wounds of the Sikh community after the 84 riots, and when he remembers the stories of Operation Bluestar, then he can hardly get the words out. What comes out instead of words is the hurt, and a simple sense of a wrong done, and of wrongs done for years and years, and bewilderment at how the richest state in India has been made a pawn of the powers that be, and then he lapses into silence, as if putting his stories in place, and those of his father and grandfather. He is old enough to know the stories of independence, and old enough to have been there in the terrible decades of Punjab, and he is old enough to remember his land with misty eyes, and old enough to know that for him there may not be a return. In all of this hurt there is surprisingly very little anger, very little desire for revenge. It is as if he accepts that these things are the things that must be, and that killing and burning in return will only cause more hurt and pain. Harinder Singh (name changed) has hostility on his face, but it is the hostility born of suspicion, of not knowing if the stranger in front of him has somehow come to catch him, to accuse him of sedition and treachery, and even from here, from this far land, somehow bind him and take him back to where there is prison and death. His stony silence says just as much though, it tells a tale of a hard life lived where being suspicious of everyone and everything is the only sure way of survival, where friends are not to be trusted and there are enemies everywhere. The two together look after the Gurudwara on this rainy November morning, when the first breath approaching winter is in the air. Gurkirat has a bad back, and in between giving out prasada he likes to lean back against a piled-high cushion of sheets and blankets. The floor is warm and the carpet is soft, and today, when it is not Sunday, the Gurudwara is almost empty. A radio channel from England plays alternately Gurbani and Katha, and Harinder when he is bored succumbs to the temptation to tune into Hindi film songs. The French, people who pride themselves on their religious tolerance, are visibly embarrassed by the international furore that their new law on religious symbols has caused. They are pains to explain what is for them the crux of their republic ' the separation of religion and the state ' and are embarrassed when such fine distinctions are not enough to explain away what is a law which seems to be racially based. The fact that a hardworking and politically dormant community like the Sikhs have been caught in the battle between conservative Christianity and a resurgent Islam is another cause for embarrassment. The French, especially the more conservative amongst them, cannot for all practical purposes completely 'ignore' turbans ' this would risk a backlash from the numerically much larger Muslim community. But at the same time they are reluctant to enforce the ban in all its rigour on the Sikhs. This is the main reason that messages from the French diplomacy are at best, confused ' neither a clear yes, nor a clear no. To be fair, the Sikh community leadership has taken provocative measures of its own, like issuing press statements on the integrality of the turban to the Sikh faith, and sensationalising the issue by going to the courts. While this action may or may not end up with the expelled students being readmitted, one side-effect will certainly be the increased alienation of the Sikh community from their French counterparts. In this sense, Sikh leadership in France seems to be going the radical Islamic way ' quick to take offence at the slightest provocation, and little inclined to back down and give the benefit of the doubt to the other. What result this will have in the long run is to be seen ' but whether the children in whose name these actions are taken will benefit is questionable. So who is right, and who is wrong? Are the Sikhs of Bobigny wrong to revolt, to go to court to enforce what they feel is their right? Are the French wrong to enforce what they feel is a basic tenet of their Republic ' the separation of religion from the State? It depends on whether you are French, or Sikh. The rights of a case, as happens so often, depend on which side of the line you are on. And what do the children feel? Do they feel embarrassed when they go to school, to know that they are the reason because of which this battle is being fought? In all the debate, in all the furious articles and counter-articles, in all the courts and in all the testimonies so far, no one has thought it fit to ask the children what it is they want. Politics has once again confused the issue at stake ' and the issue has, and will always be, to let both young and old have the freedom to choose for themselves. I'm visiting with my Family At Paris 10 APRIL 2015 ,I WILL LIKE TO VISIT GURUDAWARA SAHIB is it possible that we can get accommodation for two days ?? My daughter and I will be visiting Paris in march. I would like to know if we could stay at the gurdwara as both of us being ladies it would be safe to stay in the temple, please let me know the cost of the rooms and what days do you have the diwan. i am visiting Paris in December for a few days with my family.Is it possible that we can get accommodation one or two days. I'm visiting Paris from 20th July to 24th July, I will like to visit Gurdwara.on Sunday.Will you please tell me how to reach here from Boulevard de la chapelle?